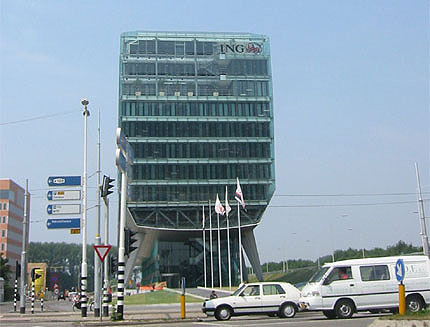 This building is for the ING (banking) Group and is used as their headquarters. As a headquarters building, it is required to represent the ideals of the company, which are fast moving, transparency, innovation, eco-friendliness, and openness. Meyer & Van Schooten Architecten were awarded the project after a competition that ING Group organized. A number of young Dutch architects were invited by ING Group to participate in the competition. The main portion of the building is elevated off the ground by stilts that range in height between 9 to 12.5 meters. 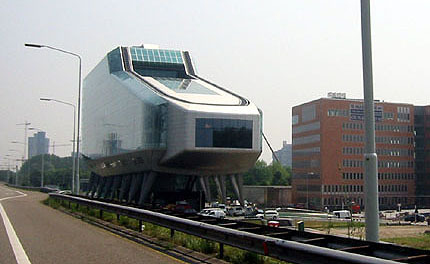 Due to the proximity to the A10 ring road (the main highway in Amsterdam), people traveling along it have a good view of the building. Also with elevated height the offices' view will not be obstructed the elevated A10 ring road. The majority of the building has glass as the façade to give the building a high level of transparency and openness. 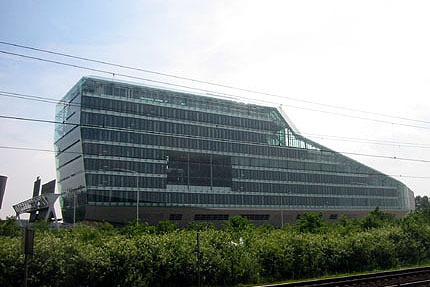 In order to avoid heat loss or overheating as a result of the amount of glass on the façade, a double skin system is incorporated. The 2 layers of glass sandwich a layer of still air to control the temperature differences between the inside environment and the outside. This configuration also helps to reduce the noise coming in from the A10 ring road. 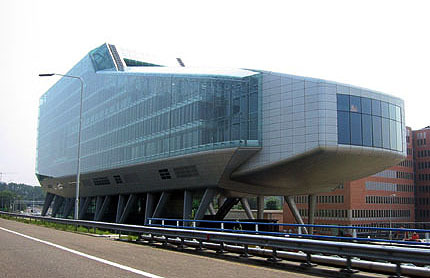 The combination of the tilting stilts on the bottom and the overall shape of the building, it makes it look as if the building is in motion. 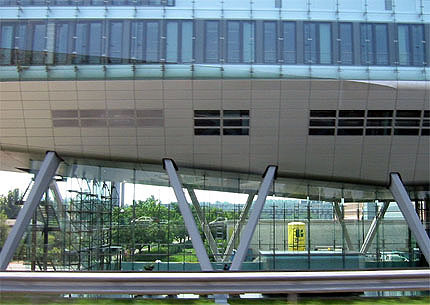 The shape of the building has earned a few nicknames for it - "shoe", "space ship", and it even has a resemblance to walking city in Archigram. No matter what the nickname, the building has definitely become one of the landmarks for the city. It is possible to bike from Amsterdam Central to the building, which is located just in the Zuidas area south west of Amsterdam. The bike ride is about 30-45 minutes. Another way to get to the building is take the Metro and get off at Amstelveenew. The building is about 5 minutes walk away from that station. Unfortunately it is not open for public to visit the interior due to business confidentiality concern. While you are there, the Olympic Stadium is also very close by. Amsterdam hosted the summer Olympic game in 1928. For more information, please visit the architect's web site at www.meyer-vanschooten.nl. To contact ING Group, the website is www.ing.com.